Bill Warner, a speed racer and tropical fish seller from Wimauma, Fla., was attempting to hit 300 mph within 1 mile when he lost control of his motorcycle and crashed earlier this year at land speed trials at the former Loring Air Force base. LIMESTONE, Maine — Land speed racing events are expected to continue at the former Loring Air Force base but with increased inspections in light of an accident that resulted in the death of racer William “Bill” Warner in July. 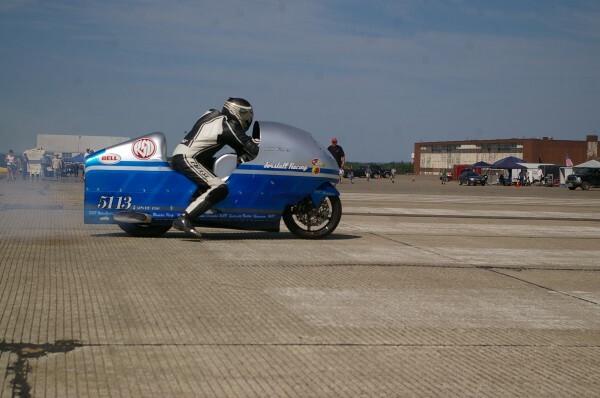 Warner, 44, of Wimauma, Fla., who set the world record for fastest speed on a conventional motorcycle, died on July 14 from injuries suffered when he lost control of his motorcycle while attempting to hit 300 mph within 1 mile during a speed trial at the Loring track. The accident that took Warner’s life appears to be the result of a problem with the rear tire, though what the exact problem was has yet to be determined, according to Loring Timing Association officials. Daly and Tim Kelly, Loring Timing Association’s race director, addressed members of the Loring Development Authority board of trustees on Sept. 11 regarding the safety and future of land speed racing events that the association holds at Loring. After Warner’s accident, the group took a close look at its inspection procedures as compared with other associations, according to Daly and Kelly. They found they were in compliance, but going forward, they will be looking at different procedures which will require vehicles traveling above 220 mph to have an inspection each time the competitor runs. Above 240 mph will require two tire inspections. Daly and Kelly said that very few competitors run at those speeds. Warner set a world record at the time trial in 2011, when he became the first conventional motorcyclist in history to top 300 mph, according to the Loring Timing Association. On a 1½-mile course, he maxed out at 311.945 mph. On July 13, the day before he died, Warner broke the 1-mile record at Loring when he hit 296 mph. Daly said that although the rear tire apparently caused Warner’s accident, an inspection beforehand showed that the tire was brand new and in compliance. The two association officials also spoke about the history of land speed racing, which came about after World War II using mostly dry lakes and salt flats as tracks. Different than road racing or drag racing, land speed racing is strictly timed trials to achieve a top speed. The purpose of the sport is solely to set records; there is no financial gain. The Loring Timing Association was formed in 2009 and since has been holding two events on the former Air Force base runway — one in the summer and one in fall. Daly has been the motorcycle inspector at each of those events. He said that the amount of inspection each vehicle undergoes during a race is based on the planned rate of speed. Kelly advised that the Loring airstrip was definitely one of the best quality racing surfaces the association has seen. The group has changed its advertising of the Limestone events to focus more on New England and southern Maine and also will take its campaign to social media, seeking to attract more racers and spectators to next year’s events. For the association, the fatal accident called into question the future of the racing event at Loring. The event brings racers and spectators from the U.S. and Canada to the area, boosting the local economy. The race is of little expense to the group and it nets revenue of a little under $5,000, according to President and CEO Carl Flora. Flora said that the longevity of the event always has been in question. For now, the seasonal events will continue as scheduled.